Shorter is the "boss" of Chinatown, a loyal friend to Ash, and a criminal with a heart of gold. Like Ash, Shorter is an unusual "thug" with a deep sense of honor, and a drive to always do the right thing. He'll go to any lengths to protect his loved ones... even when the interests of those closest to him come into irreconcilable conflict. Shorter is clever, resourceful, and as tough as steel. He's equally skilled at brawling, shooting, and sneaking around like a shadowy thief. Shorter can disguise himself as a completely different person, and fool even Eiji into thinking that he is a dotty old Chinese man. Shorter has an irrepressible sense of humor and can wear a lopsided, devilish grin even during the grimmest of circumstances. Like Ash, he is a charismatic leader who can easily unite the other kids on the street under his rule. 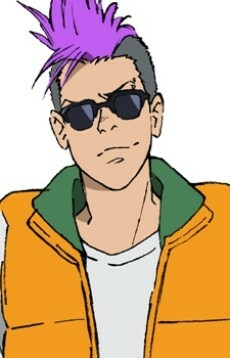 At the beginning of the series, Shorter has a mohawk hairdo. But by volume two he has shaved off all of his hair and is completely bald. Shorter's trademark fashion statement is his ever-present sunglasses. He even wears them while sneaking around a cornfield in the middle of the night! In an interview, Akimi Yoshida said that Shorter's character design was inspired by Sanburaza Nakano.